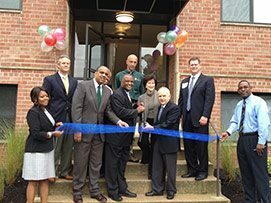 Bethesda, MD – Overlook Apartments in Hyattsville, Maryland has begun a major eight million dollar renovation project slated for completion in early 2014. Bethesda-based ROSS Development & Investment, which has owned and managed the community with its affiliate ROSS Management Services, for the past 30 years, is working on completely repositioning the asset in the Hyattsville, MD market. The massive renovation project, overseen by ROSS Companies’ affiliate ROSS Renovation & Construction, encompasses new apartment interiors, renovation of common areas, the leasing center, new landscaping and signage packages plus new mechanical systems. Located on Ray Road, near Washington, D.C. and College Park, MD, Overlook Apartments is a 187-apartment community built in 1962. The community features all utilities included in the monthly rent and offers affordable housing based on certain income guidelines. “We are servicing the needs of the moderate income community by providing a renovated product with all utilities included. In addition, we will be providing resident services that will be tailored to meet the specific needs of our residents,” says Cindy Pearre, Regional Property Manager at ROSS Management Services. ROSS Management Services, an affiliate of ROSS Companies, manages 34 apartment communities in and around the Washington, DC metro area. ROSS Companies, founded in 1983 in Bethesda, MD is a recognized leader in apartment acquisitions and investment, development, property management and renovation. With more than 11,000 apartment homes in its portfolio, the company is one of the most active multifamily real estate firms in the Mid-Atlantic region. ROSS Companies is comprised of three affiliates – ROSS Development & Investment, ROSS Management Services and ROSS Renovation & Construction. ROSS Development & Investment is celebrating its 30th anniversary this year and ROSS Management Services is celebrating 25 years in business. For more information about the ROSS Companies and ROSS Management Services, visit www.TheRossCompanies.com.